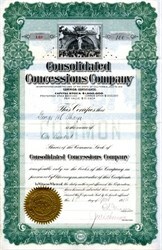 Beautifully engraved RARE certificate from the Consolidated Concessions Company issued in 1915. 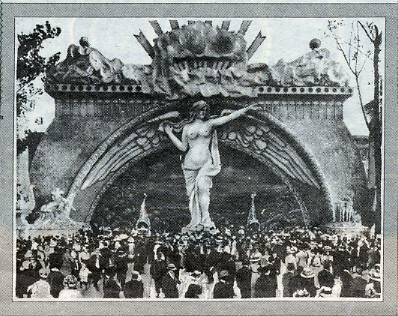 This historic document has an ornate border around it with a photograph vignette of a crowd of people in front of a large sculpture. There is also a small Panama Pacific International Exposition seal at the bottom center of the certificate. This item has the signatures of the Company�s President and Secretary and is over 90 years old. There was some initial uncertainty about where exactly to hold the fair (Golden Gate Park had been the main contender), but it was later decided to fill in the mud flats at the northern end of the city, and to build in the location currently known as the Marina. The 635 acre fair was located between Van Ness and the Presidio � its southern border was Chestnut Street and its northern edge bordered the Bay. The tallest most well-recognized building of the PPIE was the Tower of Jewels. Standing 43 stories tall, the building was covered by more than a hundred thousand colored glass "jewels" that dangled individually to shimmer and reflect light as the Pacific breezes moved them. There were many other palaces, courts, state and foreign buildings to see at the fair � however most of them were made of a temporary plaster-like material, designed to only last for the duration of the fair. Luckily, one of the primary exposition buildings, the Palace of Fine Arts, was not torn down with the rest of the buildings, and was completely reconstructed in the 1960's.